As human activities begin to stress common-pool resources (CPRs) at the planetary scale (e.g. the carbon assimilation capacity of the atmosphere and oceans, fresh water availability, etc.) developing the capacity to govern them is becoming ever more important. While we do understand some features of successful CPR governance, these past models of success are being confronted by unprecedented changes due to globalization and climate change. This challenges researchers to improve our practical understanding of the governance of CPR systems and their capacity to adapt in the face of such change. Toward this end, this paper reports on a large-N comparative case study analysis aimed at extending existing theories of CPR governance to gain deeper understanding of how the success of CPR systems depends on the broader coupled infrastructure system in which they are embedded. By coupled infrastructure system (CIS) context we refer to the natural resource systems (i.e. natural infrastructure), the hard-human made infrastructure (i.e. technology), the soft human-made infrastructure (i.e. the protocols that allow production systems to work such as norms, institutions, rules in use etc.). By increasing our understanding of CPR governance, we can identify analytical tools and principles to enhance the adaptability and transformability of CPR systems in the face of change. Ostrom’s well-known institutional design principles (DPs) provide the foundation for our work. Since Hardin’s (1968) paper that prescribed either state control or the establishment of private property regimes to avoid the overuse of shared resources, there have been many studies showing that under certain conditions, resource users themselves are able to avoid the tragedy of the commons (McEvoy 1986; Berkes et al. 1989; Feeny et al. 1990). Communities with trust, reciprocity, and social cohesion could build norms and craft formal rules that enable collective action and prevent the deterioration of CPRs (Ostrom 1990). Based on a large number of case studies, Ostrom (1990) proposed the DPs as governance regime characteristics that enable resource users to engage in collective action to manage CPRs sustainably. Unfortunately, the DPs have often been viewed as a panacea (Steins and Edwards 1999; Cleaver 2002; Bruns 2007). Given Ostrom’s warning against panaceas (Anderies et al. 2007; Ostrom et al. 2007), we contend that such an interpretation does not reflect her (1990) analysis or intent. Rather, we suggest that the DPs may be viewed as necessary conditions for successful CPR systems, contingent on the general CIS characteristics. Our aim in this paper is to clarify how clusters of DPs constitute necessary conditions for success and how these conditions depend on the CIS. To explore necessary conditions for success, we assess the co-occurrence of DPs and identify configurations of DPs that may lead to successful CPR systems. This analysis addresses Young’s (2002) and Agrawal’s (2002) assertion that since the DPs were posited as generalized propositions, they should be comparable and their presence/absence should lead to specific outcomes regardless of other contextual variables. The fact that DPs are often suggested as necessary conditions suggests that if a community does not adopt them, they will not be able to solve their CPR problems. Cox et al. (2010) have made a first attempt to assess the possible relationship between DPs and social and/or ecological “success” by conducting a case study meta-analysis. They found that the presence of each design principle (DP), taken individually, was significantly correlated with successful CPR systems (see also Ratajczyk et al. 2016). However, the presence of a single DP cannot explain why some CPR systems are successful and others are not. In fact, our analysis shows that success requires clusters of DPs and the presence or absence of individual DP’s tells us very little. To explore the relationship between DP and CPR social-ecological systems we conceptualize the latter as specific cases of CIS (Yu et al. 2015, Anderies et al. 2016): systems in which the social system, technology, and the ecological system (all examples of infrastructure) interact at different temporal and spatial scales. The notion of CIS emphasizes the fact that the dynamics (and thus success) of CPR systems depends on the interplay between multiple types of infrastructure that define the social, technical, and ecological context (Poteete et al. 2010); none of which can be viewed in isolation. From the CIS perspective, DPs refer mainly to soft human-made infrastructure that is deeply interdependent with other types of infrastructure (i.e. hard human made – canals, artificial reefs, transportation etc. – and natural – watersheds, climate, biodiversity etc.). forestry, with less intensive hard human-made infrastructure (e.g. forestry equipment) and a stationary natural infrastructure (e.g. forest products). This classification stems from the work of Schlager et al. (1994) on mobile and fixed resources, and on human-made hard infrastructure intensity following Anderies (2015), Anderies et al. (2016) and Yu et al. (2015). In the remainder of the paper, we first visualize DP co-occurrence by looking at co-occurrence frequencies for successful and non-successful cases. We then assess DP configurations (clusters) and focus on the importance of these configurations in determining success via Qualitative Comparative Analysis. Next, we look at how successful DP configurations change across the different activities: irrigation, fisheries, and forests. Finally, we discuss the importance of specific co-occurrence patterns that we assessed in cases representing successful and non-successful CPR systems. We conclude by identifying the limitations of this study and suggesting future lines of research required to develop a comprehensive approach to improve our understanding of CPR systems and, by extension, of CIS. Other papers in this special feature take up two lines of this research. Barnett et al. (2016) take a deeper look at the other possible mediating factors using qualitative analysis of inconsistencies identified in this paper. Ratajczyk et al. (2016) provide a detailed discussion of issues related to data transparency and replicability of findings through coding procedures and methodology. Both papers complement the research presented here and give a more comprehensive picture of the relationship between DPs, and the CIS in which they are embedded. To analyze the interdependencies and configurations of DPs related to success, we re-coded a subset of the cases presented in Cox et al. (2010) based on the reformulation of the DPs made by Cox et al. (2010: Table 3). However, we used a different definition of success. Cox et al. (2010) defined “success” as cases that “reported successful long-term environmental management” (Cox et al. 2010, 40). Here, as in Barnett et al. (2016), successful cases are those that have not displayed ecological deterioration (i.e. resource sustainability), nor conflict and trust issues according to the secondary data sources at our disposal. A more in-depth discussion on how we measure success is given in Ratajczyk et al. 2016, which measures overall CPR success given evidence of resource sustainability, collective choice arrangements and equity among users based on coding previously defined by Ostrom and colleagues (1989). By increasing the dimension of success, we reduce the likelihood of miscoding cases as successful in which resources are harvested sustainably albeit within highly socially contested situation. We recoded 69 of the original Cox et al. (2010) cases (limiting the cases to those referring to irrigation, fishery or forestry), 27 of which were considered complete cases (i.e. all DPs and success variables were coded). A DP was coded as present if the original author explicitly stated this to be the case, or if the DP’s presence could be inferred based on the author’s description of the case. Each case was coded by a team of three coders. Coding teams used a systematic coding protocol as detailed in Ratajczyk et al. (2016). We assessed possible discrepancies between our final coding and the coding of Cox et al. (2010) (see appendix for details). The results of such analysis (reported in Table A2) highlight the need for better coding guidelines. The purpose of presenting such assessment is not to challenge the validity of any specific coding team but only to showcase an added layer of difficulty related to understanding the puzzle of governance via secondary data sources. We encourage the inclusion and reporting of coder agreement ratings for every meta-analysis in order to increase awareness of the importance of common coding guidelines that go beyond the simple questions present in a specific coding book or survey. To explore the relationship between DP configurations and success, we adopt two main methods: visualization of DP co-occurrence and qualitative comparative analysis (QCA). The use of multiple methods allowed us to assess the validity of the results and to perform a comprehensive sensitivity analysis of our findings. Our analysis focuses on two main issues: (1) Do DPs co-occur? and (2) If they do co-occur, can we identify specific co-occurrence patterns associated with success? We assess the co-occurrence by visually depicting DP co-occurrence in the coded cases. We performed this analysis for all cases and for subsets of cases determined by the type of CPR activity (irrigation, fishery, forestry). Following a similar type of analysis, Rocha et al. (2015) analyzed the co-occurrence of drivers in marine regime shifts. DP visualization highlights possible underlying commonalities between cases that share the same DPs. This type of analysis represents a purely visual and qualitative exploratory first step. We assessed whether specific patterns of co-occurrence are associated with success via QCA. QCA analysis allowed us to assess the relationship between specific DP configurations and success. QCA, proposed and refined by Ragin (1987, 2006, 2008), allows for the comparison of case studies with respect to specific outcome variables. More precisely QCA relies on Boolean algebra for cross-case comparisons to reduce causal complexity into a minimal set of conditions necessary for an outcome (Ragin 1987). QCA establishes conditions of necessity and sufficiency. A condition is necessary if it must be present for a certain outcome to occur. A condition is sufficient if, by itself, it can produce a certain outcome (Ragin 1987). A condition is both necessary and sufficient if it is the only cause to the outcome. We employed QCA because approaches that are centered on linear relations between variables are not conceptually correct given their focus on variable distributions instead of focusing on case-by-case configurations (Kent 2009). However, QCA is very sensitive to missing or uncertain information and can be used only to analyze cases for which complete information is available. Unfortunately, with a large dataset containing cases spanning different time-frames, locations and resources, complete information is not available for all cases. Accordingly, we combined QCA analysis with a reliability metric based on missing values imputation to increase the data reliability of our results. Our “reliability” metric sets a confidence (reliability) range to the information normally presented with QCA (i.e. consistency and coverage). Reliability is especially important in our work because, e.g. QCA performed on the 27 complete cases led to the elicitation of specific DPs as necessary conditions for success. However, the conclusions derived from the 27 complete cases may not apply to the remaining 42 cases where data is incomplete and generalizations are not possible. Using reliability as an added metric to the QCA analysis allowed us to increase our sample and test the validity of the complete cases with QCA. To assess the reliability of our results, we performed QCA on the 27 complete cases and complemented that information with two other QCA analyses: one on the dataset where we assume missing data=absent (DP−) (i.e. effectively setting all missing values to 0) and one in which we assume missing data=present (DP+) (i.e. effectively setting all missing values to 1). This QCA performed on DP− and DP+ represent the boundaries of the analysis, or, in other words, the boundary values of the QCA metrics and the validity of the different solution sets. We then define reliability of coverage as 1 – standard deviation of coverage scores of the three QCA analysis; the reliability of consistency as 1 – standard deviation of consistency scores of the three QCA performed. Since consistency and coverage range from 0 to 1, our reliability metric also exhibited this range. Finally, we assessed solution reliability as the number of times a specific set was reported in the solution set. If a specific set was not reported as a solution in one of the QCA performed, we implied that coverage and consistency=0. Of the 69 cases analyzed, 25 were forestry cases, 24 were irrigation systems, and 20 were fisheries. Table 1 is an overview of success by activity, while Table 2 summarizes the data regarding the presence or absence of the DPs. The whole dataset is fairly balanced and not heavily skewed towards one type of outcome or activity. Table 2 shows a noticeable difference in missing values per activity and per DP. Further, some DPs are heavily skewed towards being present rather than absent. Summary statistics for the 11 DPs as defined by Cox et al. (2010). At first glance, the presence or absence of a specific DP does not seem to follow a specific pattern. Missing values seem to occur predominantly in the fishery activity. One might speculate that, in general, given the area covered by fishermen and the nature of the resource, DPs in fisheries are difficult to assess. Generally, when DPs are coded, their presence is more likely than their absence. Regardless of the specific DPs identified, increasing the number of DPs present in a case study generally relates to a higher likelihood of success in a CPR (see Figure 1). Successful cases had a significantly higher average of 8.7±2.6 (max=11) DPs, while unsuccessful cases had an average of 4.3±2.7. Further, cases with 10 or 11 DPs present were always successful. Percentage of successful and unsuccessful cases by number of DPs, shown for all cases (top-right), and by activity. However, from a simple uni-variate analysis it is unclear whether DPs exhibit patterns of co-occurrence, or if specific DP configurations increase the likelihood of success. In the next sections we explore co-occurrence visually and configurations via QCA. 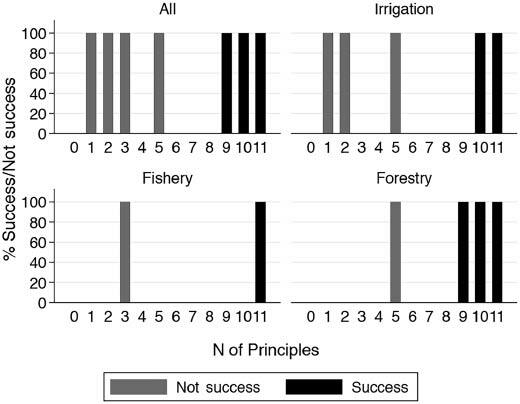 For example, Figure 1 and Table 3 suggest that either there are other variables influencing the success of fisheries or that different activities, joint with the natural and hard-human made infrastructure characteristics, require different sets of soft human-made infrastructure (i.e. norms, institutions etc. ; see Barnett et al. 2016). An alternative explanation is that it may be inherently more difficult to analyze or determine the presence of DPs depending on CIS characteristics (e.g. mobility of the natural infrastructure). While we cannot correct for this issue in our current analysis, this is an important methodological question to examine in the future. Success rate difference depending on activity and number of DPs. Figure 2 visualizes the co-occurrence of DPs. We normalize (i.e. divide the number of times DPs co-occur by the total number of not-successful and successful cases) the frequency of co-occurrence of DPs, so as to allow comparison between successful and not-successful cases. Figure 2 can be interpreted as a warning against assessing DPs in isolation, especially for successful cases. Although there is co-occurrence in both non-successful and successful cases, the co-occurrence of principles in successful cases is striking. Independently from the natural and hard-human made infrastructure characteristics, in successful cases, the presence of clearly defined social boundaries (1A) almost always co-occurs with the presence of clearly defined biophysical boundaries (1B), while others are much less likely to co-occur (i.e. nested enterprises (8) and graduated sanctions (5)). Clearly defined boundaries (1A and 1B), collective choice arrangements (3) and minimal recognition of the rights to organize (7) are very likely to co-occur. When these core principles are present, monitors actively audit CPR conditions for appropriate behavior (4A) and conflict resolution mechanisms are likely to exist (6). Congruence (2A and 2B), in general, seem to co-occur very often in successful cases, while they do not co-occur (or occur less) in non-successful cases. Finally, nested enterprises (8), graduated sanctions (5) and accountable monitoring of monitors (4B) is less likely to occur in successful cases compared to other co-occurring DPs. DPs co-occurrence in cases of successful and non-successful cases (data normalized by success). Color (represented by the scale on the right of the figure) indicates the frequency of DP co-occurrence scaled between 0 (never co-occur) and 1 (always co-occur) DPs are often grouped and co-occur, DPs in isolation do not contribute to success, further, there are groups of DPs that seem to co-occur more often in cases of success and are almost completely absent in non-successful cases, e.g. DPs 2A and 2B which co-occur very rarely in cases of non-success. DPs co-occur always with themselves, thus the diagonal is dark red as the frequency of co-occurrence=1. We refine the visualization presented in Figure 2 and depict co-occurrence by activity. Figure 3 depicts different co-occurrence patterns for activity for non-successful and successful cases. In non-successful cases, clearly defined social (1A) and biophysical (1B) boundaries co-occurred more often than other DPs. However, in irrigation systems, clearly defined boundaries also often co-occurred with collective choice (3) and monitoring (4A), while in forestry they co-occurred with collective choice (3) and minimal rights to organize (7). 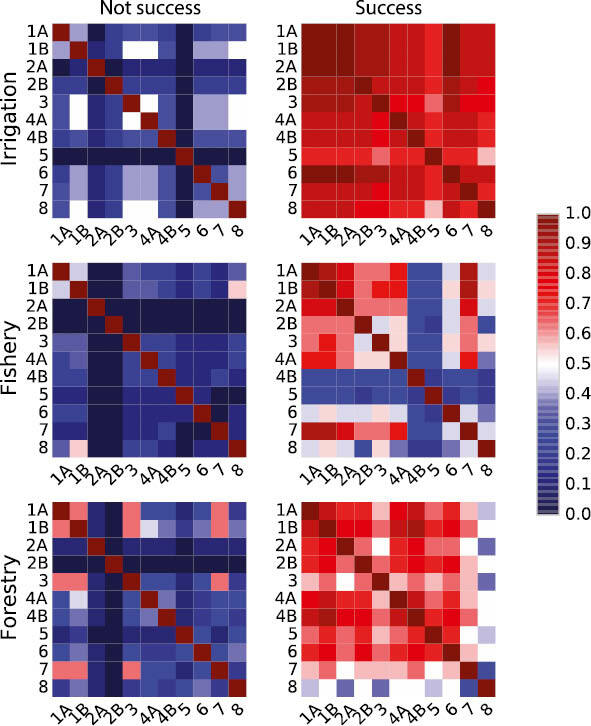 Finally, in fisheries, clearly defined biophysical boundaries (1B) often co-occurred with nested governance structures. The different patterns of co-occurrence are even more accentuated in successful cases. Nestedness (8) co-occurred less in successful forestry cases, while in fisheries, monitor accountability (4B) and graduated sanctions (5) weakly co-occurred with other DPs. Generalizing, Figure 3 hints toward a difference in the necessity of certain DPs for successful governance of CPR based on specific activities performed. Fisheries displayed strong co-occurrence of collective choice arrangements (3), rights to organize (7), congruence (2A 2B), monitoring the resource (4A) and clearly defined boundaries (1A and 1B). Forestry systems displayed the presence of almost all DPs, although nestedness (8) seemed somewhat less important. Successful irrigation systems displayed strong co-occurrence of all DPs. The difference in the co-occurrence pattern can very well be caused by differences in the type of system, leading once again, to caution against using a cure-all approach without carefully considering the overall CIS. 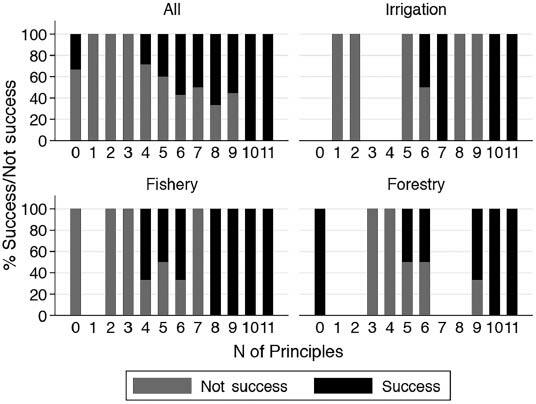 Design principle co-occurrence in successful and non-successful irrigation, fishery, and forestry. Data normalized by activity and success – i.e. the number of time DPs co-occur is divided by the total cases that are not-successful per activity (left column graphs) or successful per activity (right column graph). Color (represented by the scale on the right of the figure) indicates the frequency of DP co-occurrence scaled between 0 (never co-occur) and 1 (always co-occur). Co-occurrence increases in successful cases and different activities have different co-occurrence patterns. Irrigation systems were successful when a very high number of DPs co-occur, while fisheries needed a lower number of co-occurring DPs to be successful, with forestry cases ranking somewhere in between. The number of DPs needed for success may relate to the mobility of the resource, their re-growth rate and by the amount of hard human-made infrastructure needed. DPs co-occur always with themselves thus the diagonal is dark red (i.e. normalized frequency=1). The findings on DP co-occurrence by system type only hint at the inter­dependencies that characterize CPRs and by extension CIS. However, the analysis performed so far does not distinguish different patterns of DP configuration and their relation to success. In the next section we will consider DP configurations using QCA. The main result stemming from our previous analysis is that DPs co-occur in different patterns depending on activities related to different resource type, and that they co-occur more often in successful CPRs. Figures 2 and 3 point out the importance of DP 2A and 2B whose co-occurrence is strikingly different in non-successful vs. successful cases. This suggests that the DPs are interconnected and their configurations depend on the CIS in which they are embedded (as also pointed out by Ostrom 1990). We start by assessing the relationship between DP configurations (i.e. sets) and success by analyzing only “complete-cases”. Complete cases are cases for which all DPs have been coded. Figure 4 summarizes successes and non-successes for the complete cases in our dataset. Percentage of successful and non-successful cases by number of DPs only for cases without missing data. Graphs are presented for all cases (top-left), and by activity. Complete cases show a clear division between the number of DPs and success/non-success. Figure 4 depicts a clear division between successful and non-successful cases. All successful cases have a high number of DPs, however, if we take all cases into account (see Figure 1) the division between successful and not successful cases is much blurrier (i.e. Figure 4 vs. Figure 1). Using QCA only on complete cases, we found four sets of DPs leading to success by analyzing the complete cases and all activities (see Table A3 for details). In most combinations leading to success, DPs 1B, 2B, 4B, and 6 were necessary, but not sufficient. Successful cases also display from five to six more DPs than unsuccessful ones: (i) 1A, 2A, 4A, 5, and 8; (ii) 1A, 3, 4A, 7, and 8; (iii) 1A, 2A, 3, 5, 7; or (iv) 1A, 3, 4A, 5, 7, 8. These categories, (i)–(iv), appear to reflect sufficient conditions for success. On the other hand, the absence of 2A, 2B, and 4 greatly increases the odds of a non-successful CPR system. Looking at specific activities (i.e. irrigation, fishery and forestry), QCA gives two combinations of DPs leading to success in irrigation and forestry cases, and one DP combination for fisheries (Table A3). QCA results also report two combinations of DPs leading to non-success in irrigation systems and one in forestry and fishery systems. In cases of successful CPR management, irrigation and forestry cases contain a solution set that includes all DPs except for nestedness (8) and a solution that contains all principles except collective choice arrangements (3). All DPs needed to be present for the fishery CPR to be successful. Most non-successful CPRs lacked specific DPs: 2A, 2B, 4B and 5. In other words, it seems that, generally, all CPRs are likely to be non-successful when congruence principles (2A and 2B), accountability of monitors (or monitoring the monitors) (4B) and graduated sanctions (5) are absent. However, the absence of specific design principles varies depending whether we are looking at irrigation, fishery or forestry. Figure 5 builds on the QCA and displays the frequency in complete cases, frequency when missing values=0 and when missing values=1 (data are reported in Table A8) of each DP in successful and not-successful cases. The values assumed by each DP in each of the QCA performed is reported and joined by a straight line. The length of the line of each DP can be thought of as a “reliability” range of the DP for increasing the likelihood of CPR success. DPs located in the top left region of the graph are more likely to be present in successful cases, and absent in unsuccessful cases, while DPs located in the top right region of the graph are likely to be present in both successful and unsuccessful cases. The visual representation of the QCA results reiterates the importance of analyzing DP co-occurrences and hints to the importance of specific DPs. While DPs are only effective in combinations, certain DPs seem to be more important in facilitating successful CPR governance. For example, according to Figure 5 while clearly defined biophysical boundaries are necessary for success, they work only if combined with other DPs. Importance of specific DPs in determining CPR Success. This figure represents the frequency that a given DP is a part of a set of DPs leading to a successful case, as well as the frequency that a given DP is part of a set of principles leading to a non-successful case. For each DP, we report the average frequency, frequency given in case of missing values=0 and missing=1 (data are reported in Table A8). DPs located in the top left region of the graph are more likely to be present in successful cases, and absent in unsuccessful cases, while DPs located in the top right region of the graph are likely to be present in both successful and unsuccessful cases. If we were to find DPs located in the bottom left region of the graph, they would be not significant (not present in either successful or non-successful cases), while if DPs were located in the bottom right region of the graph, they would be prone to be detrimental to success (they are disproportionally present in case of non-successful cases and almost always non-present in successful cases). This figure highlights the importance of congruence between social and environmental conditions and rules and proportionality between investment and extraction (2A and 2B). Given the small number of complete cases (see Table A4, A5, A6 and A7 under complete cases), any conclusion drawn from QCA analysis needs to be interpreted with caution (especially for fisheries). Our reliability analysis increases the number of cases included in the QCA analysis by assigning a 0 or 1 to missing values. Table A3 shows the combination of DPs leading to success and to “not-success” depending on whether we look only at complete cases, when we set missing values=0 and missing values=1 as well as reliability indexes for each solution set. Our reliability analysis is a warning against identifying general solution sets within a system type (see also Figure 5). The reliability of conclusions diminishes the confidence in a specific solution set. No DP, alone, leads to successful outcomes (i.e. no single DP is sufficient and necessary for success) but a combination of more than eight DPs seems to greatly increase the odds of success independent of the type of resource. Further, the absence of DPs 2A, 2B, 4B and 5 seems to increase the likelihood of non-success. These results confirm the importance of designing CPRs without relying on simple assumptions and causal pathways. Most of the solutions stemming from the analysis of complete cases are only one of several possible avenues to a successful outcome. What we have learned from our analysis regarding how DPs interact to affect the performance of CPR governance can be organized at two levels, across all activities and per type of activity analyzed. DPs work together, not in isolation. The success of a case depends on the type of CPR, and a combination of social “infrastructure” that is suitable to the ecological conditions. In other words, our analysis reveals the importance of congruence between rules and local conditions (2A) and the proportionality between investment and extraction (2B). As shown in Figure 5, DPs 2A and 2B are present in successful cases, and are rarely present in cases where CPR management is not successful. This general pattern is observed for all activities. Congruence (2A and 2B) seems to be the linchpin for success, independent from the type of system. Congruence between local conditions and rules seems to highlight the importance of ecological knowledge of the environment in which a CPR is embedded. Proportionality of investment/extraction can be related to the perceived equity of allocation rules governing a CPR. The importance of 2A and 2B is also highlighted by recent experimental results based on irrigation systems where inequality plays a key role in determining the level of collective action (see Janssen et al. 2011; Anderies et al. 2013; Baggio et al. 2015). This result is also confirmed by the computational models based on irrigation experiments (Baggio and Janssen 2013; Janssen and Baggio 2016). In such models, learning another’s behavior, the resource dynamics jointly with the proportionality of investment and extraction seem to be key features of sustained collective action. Combining congruence principles with graduated sanctions (5) leads to an even higher chance of success. Graduated sanctions is the third piece of the puzzle that is necessary to increase the likelihood of successful CPR. Graduated sanctions are, together with the congruence DPs, the most important determinant of successful CPRs independent of specific activities characterized by intensity of the hard-human made infrastructure and the mobility of the natural infrastructure. Our analysis also reveals interesting co-occurrence patterns between specific DPs. While the co-occurrence of clearly defined social (1A) and biophysical (1B) boundaries can be obvious, the high co-occurrence between collective choice arrangements (3) and rights to organize (7) can be evidence of the feedback between governments and resource-using communities. Other scholars have suggested that the efficacy of the relationships and interactions between government and resource users are highly important for governing resource use (e.g. Pelling 1998; Adger 2003; Barnett and Eakin 2015). Barnett and Anderies (2014) hypothesized that this combination of factors may mutually reinforce each other, the absence of these two principles may weaken the congruence between rules and local social and ecological conditions. However, we cannot confirm such hypotheses here, since DPs 3 and 7 seem to have a higher co-occurrence in sets leading to non-successful CPRs. Although we can affirm that there are core sets of principles that may be fundamental to increase success, final outcomes are dictated by DPs that differ depending on specific characteristics of the natural and hard human made infrastructure. The DPs that are necessary for success depend on the type of such infrastructural characteristics. 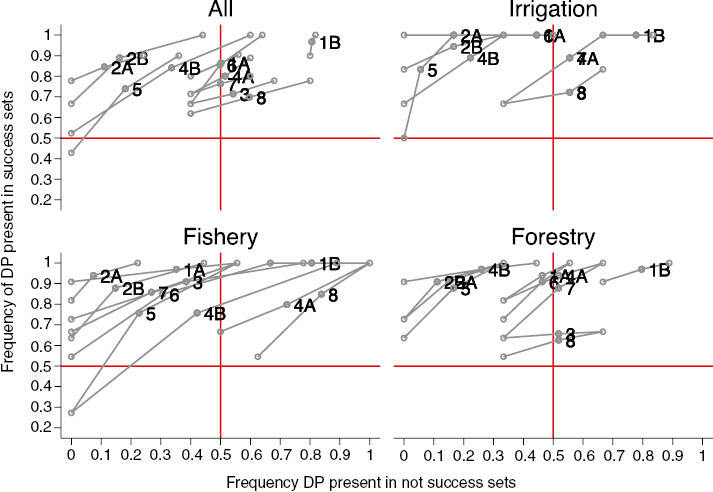 For example, monitoring the monitors (4B) is an important factor in irrigation and forestry cases, but much less so in fisheries (see Figure 5). The difference in DP importance could very well be related to the mobility of the natural infrastructure and the intensity of the hard human-made infrastructure (i.e. “technological needs”). The three main activities examined, are classified in relation to intensity of hard human-made infrastructure needed, representing the effort and investment necessary for specific activities to be performed (from skiffs and axes to canals in cement and freezer-trawlers) and resource mobility (from forest product and oysters to water in an irrigation system, to tuna). The mobility of the resource and the static nature of the hard human made infrastructure plays an important role in determining the probability of actually applying monitoring (4A) programs and the importance of having clearly defined social boundaries (1A). Irrigation systems, in many cases, and likely in the cases described herein, are often amenable to monitoring. Tail-enders need only to look upstream to know why they have little or no water. This ease of monitoring is most pronounced in irrigation systems on steep slopes, where visibility is increased, and distance between plots of land are smaller (Trawick 2001; Cifdaloz et al. 2010). Fisheries often encompass large areas of open-sea and mobile fish species, and are thus more difficult to monitor, however, fisheries can also resemble farming in case of localized, stationary fishery such as lobsters, oysters and so on. Additionally, increasing technical efficiency and the mobility of fishing fleets has allowed fishing vessels to extend their effort over larger areas. While fishing communities often self-monitored their fishing grounds adjacent to their shores (e.g. Davis 1984; Acheson 1987), the increasing expanse of fishing grounds has made this much more difficult, regardless of whether boundaries have been defined or not (Barnett and Eakin 2015), hence the importance, for fisheries to be successful, to have clearly defined social boundaries (1A). The difference in monitoring applicability depending on the characteristics of the CIS relates also to the actual applicability of graduated sanctions. A hint on how graduated sanctions could be applied may be the importance of monitoring the monitors (4B). The importance of DP 4B is also given by its absence as a seemingly necessary condition for non-success (in complete cases). Monitoring the monitors is a way to increase monitor accountability, since it relates to a higher likelihood of CPR success. Figure 6 summarizes our results and can be thought of as a starting point to assess CPR typologies based on intensity of hard human-made infrastructure, mobility of the natural infrastructure and their relationship with soft human-made infrastructure. Specific soft human-made infrastructure requirement depending on hard human-made infrastructure intensity and natural infrastructure mobility. Based on our analysis we highlight which DPs are important for different combinations of natural and hard human-made infrastructure. While congruence (2A and 2B) is ubiquitous, mobility and intensity determine the importance of different DPs. Graduated sanctions (5) and monitoring (4A and 4B) assume importance when the natural infrastructure has a lesser degree of mobility, while the type of monitoring is dependent on the intensity of the hard human-made infrastructure. Clearly defined social boundaries (1A), on the other hand, acquires importance with increased natural infrastructure mobility. To summarize, linking Figure 5 and the QCA analysis to Figure 6 allows us to suggest that while there are commonalities across CPRs systems, like the need for congruence (2A and 2B), there are also specific soft human-made infrastructure that are more important depending on specific CPR characteristics: graduated sanctions (5) and monitoring (4A and 4B) in high intensity hard human made infrastructure systems and a medium level of mobility of the natural infrastructure; graduated sanctions (5) and monitoring the monitors (4B) in lower intensity hard human made infrastructure and low mobility (or none) of the natural infrastructure; clearly defined social boundaries (1A) in lower intensity of hard human-made infrastructure and high mobility of natural. Differences in combination of DPs leading to success and co-occurrence of DPs depending on the natural and human hard made infrastructure confirms the importance of DPs as a first diagnostic tool to determine the “health” of a CPR. However, we need to stress the fact that Figure 6 is only a starting point as it applies only to the subset of cases that we have examined here. Our analysis looks at irrigation, fishery and forestry activities as a whole. At this stage we have not refined our study to take into account whether the canal systems used for irrigation activities contain storage units that change the level of mobility of the natural infrastructure (Schlager et al. 1994), the type of fishery (i.e. oysters -> not mobile, vs. tuna -> very mobile), or the intensity of forestry activities. Further we do not look at other dimension of the natural infrastructure (e.g. amount and/or diversity). Finally, we also need to clarify that we do not analyze cases dealing with pastoralism, groundwater, biodiversity etc. More work is needed to assess the validity of such starting point by including a more diverse set of CPR systems based on different types of natural and hard human made infrastructure. While we provide an estimate of reliability for the successful combinations of DPs, the successful combinations are based only on cases with complete information and cannot fully explain the results from the complete dataset (see the disparity between Figures 1 and 4, Table A3). Both analyses performed (QCA and network visualization) show that cases where all DPs are present have a much higher likelihood to be determined as successful CPRs. This analysis also indicates that there are important CIS characteristics that reduce the certainty of prescribing them in all cases. We recommend caution when applying QCA to meta-analysis of case studies based on secondary data sources and for which no firsthand information is available. QCA allows us to better understand the multiple factors that correlate to social and ecological success, but this method must be tested for robustness and generalizability to those cases without complete information. Albeit the limitations identified, different analysis methods point to the same results: there is no panacea, and combinations of DPs are necessary, but insufficient indicators for successful CPR governance. In a constrained environment, we can still increase the opportunities of successful performance by implementing design principles being mindful of the importance of their co-occurrence and possible causal relationship between them (i.e. clearly defined boundaries may be a necessary condition for congruence to occur). The work presented is a first step in using the DPs to build robust governance structures into CPR management regimes. Robust governance structures are fundamental to navigate and anticipate changes so as to maintain the ability of CPRs to function. Our first and probably most obvious conclusion is that DPs should not be viewed in isolation. More DPs present in a specific system increase the likelihood that the system is successful. Nonetheless, DPs may require further unpacking because many are actually combinations of multiple factors themselves (Agrawal 2001). This analysis is another step towards a systemic approach to distinguish different CPR typologies and possible signals leading to success or non-success of such systems from a social (i.e. equity and legitimacy, conflict etc.) and ecological (avoiding deterioration of resources) perspective. Although, trouble-shooting based on DPs alone may not be appropriate for every case and every type of resource, our analysis demonstrates that it can definitely be an interesting and fruitful approach to governing natural resources. Clearly defined boundaries, conflict resolution mechanisms, community participation, feedback between higher levels of governance and user communities are all equally important and must be present if we are to adaptively manage the complexities of CPRs. Still many important and difficult challenges remain; for example, understanding social and ecological contexts and factoring alternative explanatory variables. Even more work is needed to assess the dynamics and interdependencies between social, technical and ecological systems. Analyzing dynamics of these interdependent systems is, in our view, a fundamental step to proactively managing CPRs and natural resources more broadly. We are aware that our study may be limited due to the available cases drawn upon, our definitions of success (and importance of partial success), and the lack of possible important contextual variables. Additionally, our analysis reflects a series of snapshots of CPRs, without explicit consideration of time lags and change over time. Further investigation into the cases with missing data, either through field methods or literature review, could increase the statistical power of our results. Additional coding efforts to identify other important contextual factors would improve the power of a diagnostic approach to understanding social and ecological sustainability. However, we also think that this work is a clear first step in looking at the complexities of common pool resources with multiple methods, from case study to statistical analysis, to using network analysis and visual aids. Supplementary File 1: http://doi.org/10.18352/ijc.634.s1 S1 Supplementary material. Coding processes, reliability testing and results, and Qualitative Comparative Analysis (QCA) tables. We thank Ganesh Shivakoti, Rachata Muneepeerakul, Edella Schlager and three anonymous referees for their valuable feedback. We acknowledge support from NSF Grant GEO-1115054 and the Center for Behavior, Institutions and Environmental Change at ASU. Acheson, J. M (1987). The Lobster Fiefs Revisited: Economic and Ecological Effects of Territoriality in the Maine Lobster Industry In: The Question of the Commons. McCay, B. J and Acheson, J. M eds. Tucson, AZ, USA: University of Arizona Press, pp. 37–65. Adger, W. N (2003). Social Capital, Collective Action, and Adaptation to Climate Change. Economic Geography 79(4): 387–404. http://dx.doi.org/10.1111/j.1944-8287.2003.tb00220.x. Agrawal, A (2002). Common Resources and Institutional Sustainability In: The drama of the commons. Ostrom, E, Dietz, T, Dolšak, N, Stern, P. C, Stovich, S and Weber, E. U eds. : 41–86. Washington, DC, USA: National Academy Press. Anderies, J. M (2015). Understanding the Dynamics of Sustainable Social-Ecological Systems: Human Behavior, Institutions, and Regulatory Feedback Networks. Bulletin of mathematical biology 77(2): 259–280. http://dx.doi.org/10.1007/s11538-014-0030-z. Anderies, J. M, Rodriguez, A. A, Janssen, M. A and Cifdaloz, O (2007). Panaceas, Uncertainty, and the Robust Control Framework in Sustainability Science. Proceedings of the National Academy of Sciences 104(39): 15194–15199. http://dx.doi.org/10.1073/pnas.0702655104. Anderies, J. M, Janssen, M. A, Lee, A and Wasserman, H (2013). Environmental Variability and Collective Action: Experimental Insights from an Irrigation Game. Ecological Economics 93: 166–176. http://dx.doi.org/10.1016/j.ecolecon.2013.04.010. Baggio, J. A and Janssen, M. A (2013). Comparing Agent-Based Models on Experimental Data of Irrigation Games In: Proceedings of the 2013 Winter Simulation Conference. Pasupathy, R, Kim, S.-H, Tolk, A, Hill, R and Kuhl, M. E eds. : 1742–1753. Piscataway, New Jersey, USA: IEEE. http://dx.doi.org/10.1109/WSC.2013.6721555. Baggio, J. A, Rollins, N. D, Pérez, I and Janssen, M. A (2015). Irrigation Experiments in the Lab: Trust, Environmental Variability, and Collective Action. Ecology and Society 20(4): 12. http://dx.doi.org/10.5751/ES-07772-200412. Barnett, A. J and Anderies, J. M (2014). Weak Feedbacks, Governance Mismatches and the Robustness of Social-Ecological Systems: An Analysis of the Southwest Nova Scotia Lobster Fishery with Comparison to Maine. Ecology and Society 19(4): 39. http://dx.doi.org/10.5751/ES-06714-190439. Barnett, A. J and Eakin, H. C (2015). We and Us, not I and Me”: Justice, Social Capital, and Household Vulnerability in a Nova Scotia Fishery. Applied Geography 59: 107–116. http://dx.doi.org/10.1016/j.apgeog.2014.11.005. Berkes, F, Feeny, D, McCay, B. J and Acheson, J. M (1989). The Benefits of the Commons. Nature (340)(6229): 91–93. http://dx.doi.org/10.1038/340091a0. Bruns, B (2007). Community Priorities for Water Rights: Some Conjectures on Assumptions, Principles and Programmes. Community-Based Water Law and Water Resource Management Reform in Developing Countries. van Koppen, B, Giordano, M and Butterworth, J eds. : 28–45. Wallingford, UK: CABI. http://dx.doi.org/10.1079/9781845933265.0028. Cleaver, F (2002). Reinventing Institutions: Bricolage and the Social Embeddedness of Natural Resources Management. The European Journal of Development Research 14(2): 11–30. http://dx.doi.org/10.1080/714000425. Cifdaloz, O, Regmi, A, Anderies, J. M and Rodriguez, A. A (2010). Robustness, Vulnerability, and Adaptive Capacity in Small-Scale Social-Ecological Systems: The Pumpa Irrigation System in Nepal. Ecology and Society 15(3): 39. Davis, A (1984). You’re Your Own Boss: An Economic Anthropology of Small Boat Fishing in Port Lameron Harbour, Southwest Nova Scotia. PhD thesis. Toronto, ON, Canada: University of Toronto. Feeny, D, Berkes, F, McCay, B. J and Acheson, J. M (1990). The Tragedy of the Commons: Twenty-Two Years Later. Human ecology 18(1): 1–19. http://dx.doi.org/10.1007/BF00889070. Janssen, M. A and Baggio, J. A (2016). Using Agent-Based Models to Compare Behavioral Theories on Experimental Data: Application for Irrigation Games. Journal of Environmental Psychology, http://dx.doi.org/10.1016/j.jenvp.2016.04.018. Janssen, M. A, Anderies, J. M and Cardenas, J. C (2011). Head-Enders as Stationary Bandits in Asymmetric Commons: Comparing Irrigation Experiments in the Laboratory and the Field. Ecological Economics 70(9): 1590–1598. http://dx.doi.org/10.1016/j.ecolecon.2011.01.006. Kent, R (2009). Case Centered Methods and Quantitative Analysis. Handbook of Case-Based Methods. Ragin, C. C and Byrne, D eds. Thousand Oaks, CA: Sage, pp. 184–207. McEvoy, A. F (1986). The Fisherman’s Problem: Ecology and Law in the California Fisheries, 1850–1980. New York, USA: Cambridge University Press. Ostrom, E (1990). . Governing the Commons: The Evolution of Institutions for Collective Action. New York, USA: Cambridge University Press. Ostrom, E, Agrawal, A, Blomquist, W, Schlager, E and Tang, S. Y (1989). CPR Coding Manual, Unpublished manuscript. Available at: https://seslibrary.asu.edu/sites/default/files/cprcodingmanual-fullwcovercopytoc.pdf. Pelling, M (1998). Participation, Social Capital and Vulnerability to Urban Flooding in Guyana. Journal of International Development 10(4): 469–486. http://dx.doi.org/10.1002/(SICI)1099-1328(199806)10:4<469::AID-JID539>3.0.CO;2-4. Poteete, A. R, Janssen, M. A and Ostrom, E (2010). Working Together: Collective Action, the Commons, and Multiple Methods in Practice. Princeton, New Jersey, USA: Princeton University Press. http://dx.doi.org/10.1515/9781400835157. Schlager, E, Blomquist, W and Tang, S. Y (1994). Mobile Flows, Storage, and Self-Organized Institutions for Governing Common-Pool Resources. Land Economics 70: 294–317. http://dx.doi.org/10.2307/3146531. Steins, N. A and Edwards, V. M (1999). Collective Action in Common-Pool Resource Management: The Contribution of a Social Constructivist Perspective to Existing Theory. Society and Natural Resources 12(6): 539–557. Ragin, C. C (1987). The Comparative Method: Moving beyond Qualitative and Quantitative Strategies. Berkeley, CA: University of California Press. Ragin, C. C (2006). Set Relations in Social Research: Evaluating Their Consistency and Coverage. Political Analysis 14(3): 291–310. http://dx.doi.org/10.1093/pan/mpj019. Ragin, C. C (2008). Redesigning Social Inquiry: Fuzzy Sets and Beyond. Chicago: University of Chicago Press. http://dx.doi.org/10.7208/chicago/9780226702797.001.0001. Ratajczyk, E, Brady, U, Baggio, J. A, Barnett, A. J, Perez-Ibara, I, Rollins, N, Rubiños, C. A, Shin, H. C, Yu, D. J, Aggarwal, R, Anderies, J. M and Janssen, M. A (2016). Challenges and Opportunities in Coding the Commons: Problems, Procedures, and Potential Solutions in Large-N Comparative Case Studies. International Journal of the Commons 10(2): 440–466. http://doi.org/10.18352/ijc.652. Rocha, J, Yletyinen, J, Biggs, R, Blenckner, T and Peterson, G (2015). Marine Regime Shifts: Drivers and Impacts on Ecosystems Services. Philosophical Transaction of the Royal Society B 370(1659): 20130273. Trawick, P. B (2001). Successfully Governing the Commons: Principles of Social Organization in an Andean Irrigation System. Human ecology 29(1): 1–25. http://dx.doi.org/10.1023/A:1007199304395. Young, O. R (2002). The Institutional Dimensions of Environmental Change: Fit, Interplay, and Scale. Cambridge, Massachusetts, USA: MIT Press. Yu, D. J, Qubbaj, M. R, Muneepeerakul, R, Anderies, J. M and Aggarwal, R. M (2015). Effect of Infrastructure Design on Commons Dilemmas in Social − Ecological System Dynamics. Proceedings of the National Academy of Sciences 112(43): 13207–13212. http://dx.doi.org/10.1073/pnas.1410688112.